Under his leadership, the originally small, one-room shop grew rapidly and soon reached its current size, occupying the full ground floors of both 47 and 49 Rákóczi út. 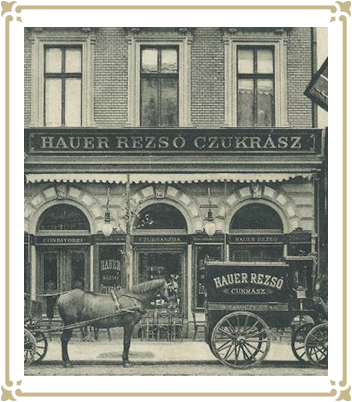 Rezső Hauer became a successful and respected businessman, and was elected the permanent honorary chairman of the Confectioners’ Guild in Budapest following Emil Gerbeaud’s death in 1920. His most famous cakes included the Hauer cream cake as well as pastries and cakes with pineapple and marzipan. After the communist takeover in 1948, his business was forcibly nationalised and Rezső Hauer died shortly afterwards. His business was renamed Erkel confectionery (after the famous Hungarian composer) and despite state ownership, it managed to retain some of its old-world charm until the fall of communism. Shortly later it was closed for nearly a decade and fell into decay. At the end of the 1990s a Hungarian entrepreneur bought it, renovated it and finally reopened it for a few years, but had to close it again following various difficulties. Despite the decade-long troubles, Hauer still evokes vivid memories. 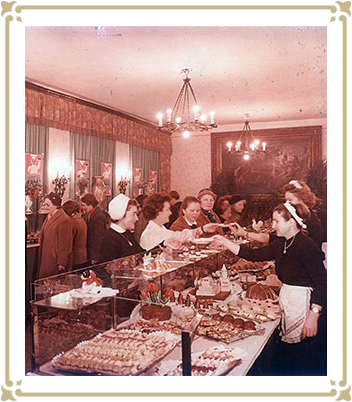 Former guests remember the sweet-smelling pastries, cakes and ice-cream from their youth or childhood – when they visited Hauer to order a cake for their loved ones, to enjoy a pastry on Sundays or just a quick ice cream after school. The latest chapter of the Hauer Café and Confectionery started in December 2016 – and will hopefully last another 118 years. The legend has been reborn.